In late April , after the CVA meeting, I visited Rudolstadt, as did Leo Coffeng, Jan van der Werff and Ad van Selms. It is hard to imagine anything more fun than an Anchor trip with Anchor friends as company. So this month the web site is going to be very different. No builder site. And no building that I constructed myself. The emphasis will be on Richter, his factory and new "sights" that one now can see in Rudolstadt. During my recent visit to Rudolstadt I saw this picture in the Richter Villa. 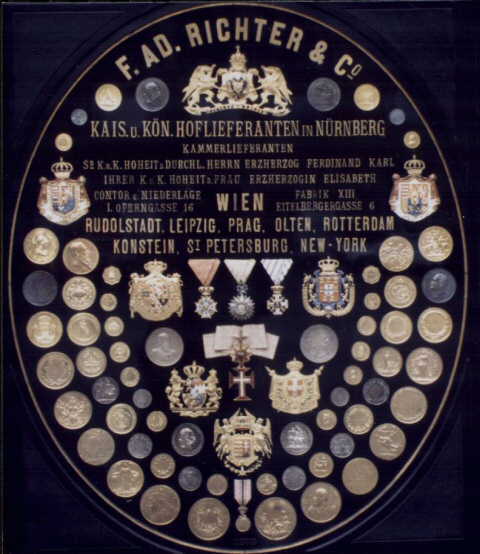 (I have been informed that the collection of awards is on display in Schloß Heidecksburg, but I have not seen it there, despite many visits.) Even after 10 visits in the last 11 years, I find I have yet another reason to visit. The new set of building plan books has been finished. They can be purchased through this web site. Just look at the subpage on the new puzzles and sets made by the new Anchor factory. The new booklets of building plans for set GK-NF # 12, sponsored by the CVA, is now completed and available. It costs $ 15.00, post paid. I have only five sets if copies on hand, so order now, without delay. When you see these books, you will be impressed with the quality of the designs. Three CVA members contributed design -- Fred Schlipf (USA), Dieter Wellmann (Germany) and Wolfgang Fichtner (Germany). If you purchase this book along with one of the new building sets, the cost is only $10.00 -- a special bargain price that is otherwise only available to CVA members, and they always add postage costs. I have decided to eliminate "my page" as a regular feature of this web site. When I build a new structure, I will reinstate this page for a month. But this month I am adding (back) my page. Not one of my Anchor buildings, but things that I saw that I think you might like to see -- like Richter's office in the factory. This month we take a closer look at the Richter Villa and Rudolsbad, which burned in 1919. During some modernization of the Richter Villa's utilities, they discovered the stone building blocks used as fill in about 1890! Richter's Anchor Stone Building Sets (Richters Anker Steinbaukasten) were the world's most popular construction toy from the early 1880s through W.W.I. These building stones were made in Rudolstadt, Thuringia, Germany, (and at the company's branches in Vienna, New York and, possibly, St. Petersburg, Russia). Starting in 1880, Richter's Anchor building stones were covered by international patents and trademarks. Today, there are many collectors and builders using Anchor Stone Building Sets. These collectors often participate in setting up Anchor displays at various exhibitions. A number of them are members of the international Club of Anchor Friends (Club van Ankervrienden), a Dutch club with members from the Netherlands, Belgium, France, Germany, Austria, Switzerland, Great Britain and the USA. The meetings of the Club of Anchor Friends has been moved to the Hotel Lapershoek in Hilversum. Sets and puzzles are being produced again! The quality is high. I urge people interested in starting Anchor building, and those who want to provide their educational benefits to their children, to consider buying new puzzles and sets. Also I may have available a limited selection of old sets, including a new set and some special prices. Anchor Stone Building Sets are great presents, and the supplement sets make wonderful follow up gifts. These new sets recently won the 1997 Parents' Choice Gold Medal. In 1999, the Anchor sets won the National Parenting Publications Award. For an 1880 toy to win in 1997 and 1999 says a lot about the quality of these sets and Anchor in general. These sets are a perfect supplement to computers. For those who are really interested in Anchor stones, I have written a book about them. (I just got tired of either looking up the same information again and again, or trusting my memory on specific details such as dates and names.) It is expensive, $70 (or 100 DM) ppd, because I print it myself on my PC and color ink is expensive. The book undoubtedly contains far more information about Anchor stones and sets, the Richter company, etc. than you'll ever want to read. This book is a lot of work to print (I print about a dozen at a time, in either English or German, and it takes a week, full time. ), so please don't think I am urging you to buy one. The book is also available on CD-ROM. See below. The CVA has published its Stone Catalog, which covers all of the stone shapes Richter made, plus shapes made by other innovators. Metal parts and most other accessories are included in the catalog. The contents of the sets are also listed. Because of popular demand, some more catalogs were printed. I have only one more here in the USA. I do not know whether more will be printed before the new one is available -- late this year or next year. (It seems to me they will have to print some more. These looseleaf catalogs (pages only - without hard covers) cost $25, postage included. All Anchor people need, and will want, a copy. Web Page Notes: Most subpages do not change from month to month. The "builder's page" is revised every month. A few people have asked me to number the "issues" of the Anchor page. Well, they started in August, 1996, (with Vol. 1, # 8, to keep the number of the month the same as the issue's number). The number of this "issue" is shown at the top of this page. All web pages are found in the CD-ROM Archive, CD-ROM # 3. See below. CD-ROM Archive: I can supply the CD-ROMs of the CVA's CD-Archive. More scans are being added all of the time, and the "holes" in the documentation are being filled. Of course, more scans means more CDs, and as scans are added some files are moved to other CD. As of today, there are 9 CD-ROMs in the Archive, plus, for CVA members only, 6 additional CD-ROMs of the old MLBs. (Do not try to buy these MLB CD-ROMs unless you are a CVA member. I check the membership list.) All of the scans are JPG files. # 1 contains the GK-NF building and layer plans, excluding # 34; # 2 contains the DS and # 34 building and layer plans; # 3 contains all packing plans, plus additional documentation such as catalogs, covers, odd, cut-out figures, inserts and rulers; # 4 contains the building and layer plans for the second series of GK-Br and Imperator, the VE series; # 5 contains the KK building and layer plans; # 6 contains documentation including my book in both English and German and various magazines (like the Anker Zeitung) and magazine articles; # 7 contains the building and layer plans for the series 100 (Neue Reihe), 200 (Modern [American] House Series0, 300 (Landhaus [Country House] sets), 400 (Festungs- und Burgen-Baukasten [fortress and castle sets]), NS, Capital, Täfelchenlegen, mosaic sets, games, EF (first series), VEB, Imperator (all metal), LaVelle; # 8 contains the building and layer plans for the series GK-AF, A-B (American Bridges), Comet, Eagle, Orion, Eisenbrücken, and the first series of GK-Br and Imperator; # 9 contains various additional documentation like advertisements, exhibits, factory (including Rudolsbad), Richter, Rudolstadt, other products (like Lebkuchen, medicines and mechanical music instruments) and Personal Designs. I will continue to scan more books and will add them to the CD-ROM Archive. Members of the Club of Anchor Friends only can also obtain the six CD-ROMs containing all of the MLBs, including both the English and the German language translations. If you want to buy one or more of these CD-ROMs, please send $2 for the first CD-ROM and $1 each for the rest -- postage included, no matter where it is going. CDs are inexpensive, so I do not see a problem if, at this stage of the Archive, some CDs become obsolete due to location of files. My e-mail address is georgeh@ankerstein.org. That address is an alias for my 'real' e-mail address, which is georgeh@ankerstein.org. But if I ever change the ISP for the web site -- www.ankerstein.org -- my 'rlc' e-mail address would change, but my 'ankerstein' e-mail address is (more or less) permanent. Another web problem connected with the change of ISP has been the loss of a reference on most of the search engines. I am putting the page back up, but it takes time. Many new graphics, and additional text, are uploaded once a month, as close to the first as possible. I do not change the full set of graphics, as most people never read beyond the first page. If you only have a little time, I urge you to take a look at the "builders" page. And please plan to drop by monthly to see the new pictures. In the restricted space of my home page, I can provide only a limited view of the wonderful world of Richter's Anchor stones. For the month of June, 2001. No Java. No music. No moving icons. No garbage. Ever. Just Anchor.